I am sensitive to gluten. As a result, I experience common digestive symptoms when exposed to gluten, especially bloating, abdominal pain, cramping, and some gas. As someone who has been on a gluten-free diet for a number of years, I often am asked if I have celiac disease when I signal to the waiter, “Is this gluten-free?” Others have wondered out loud why I avoid gluten if I am not celiac. I understand that sediment. After all, the mainstream media declared gluten sensitivity a myth based on a study published in the Gastroenterology journal in 2013. 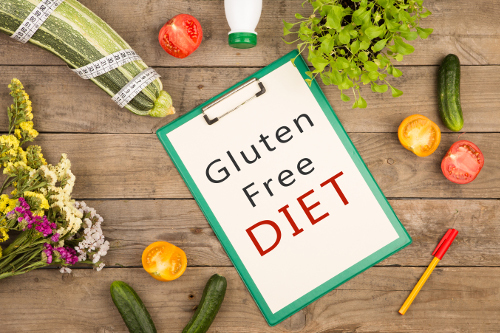 However, the media failed to report that the results did show that reintroducing gluten to the diet did worsen symptoms in patients with non-celiac gluten sensitivity and irritable bowel syndrome. As someone with experience on the matter, the issue of gluten sensitivity is all too real, and it is not just in your head. Dr. Alessio Fasano is a world authority on gluten research and celiac disease, and is the head of research at the University of Maryland Celiac Research Center. According to Dr. Fasano, 60% to 70% of people that think they have celiac disease and seek help from the research center have gluten sensitivity. This means standard celiac testing did not show a reaction to gluten. That being said, the 2013 study also found that gluten alone is likely not responsible for the health effects that many without celiac disease experience as a result of gluten consumption. Other factors beyond gluten in wheat and non-gluten foods can play a role in both celiac and non-celiac related symptoms and health effects. Research published in the Alimentary Pharmacology and Therapeutics journal in 2009 shows that celiac patients following a strict, gluten-free diet never actually heal the gut or make a full recovery, despite being on a gluten-free diet for many months and even years. Let me explain the gluten-free diet, and why you might still experience unwanted symptoms. Sometimes I still experience gluten sensitivity symptoms, despite avoiding gluten like it’s my job. You become very good at it. Gluten is a family of proteins found in all sorts of grains and products that include wheat, rye, barley, kamut, spelt, triticale, semolina, breads, baked goods, pastas, cookies, pizza, crackers, spices, and seasonings. Even varieties of alcohol like beer contain gluten. The two key proteins in gluten are glutenin and gliadin, but most of the negative effects associated with gluten intolerance are due gliadin—also considered a type of prolamin. It is thought that many people have problems properly digesting gluten. This is where the immune system interprets gluten proteins in the digestive tract as foreign invaders, and the immune system will attack the gluten, and also the digestive wall. This scenario is common with celiac disease, and also non-celiac gluten sensitivity. Other conditions associated with gluten intolerance include wheat allergies, autism, irritable bowel syndrome, gluten ataxia, schizophrenia, leaky gut syndrome, and malabsorption. This also includes autoimmune conditions like hypothyroidism, anemia, seizures, memory problems, hair loss, infertility and hormone imbalance, headaches, fatigue, and skin problems, as well as mood disorders like depression, anxiety, and bipolar disorder. Instead, I would consume gluten-free foods like brown rice, quinoa, corn, arrowroot, millet, teff, amaranth, sorghum, and buckwheat. Oats are gluten-free naturally, unless contaminated with wheat. Gluten-free flour alternatives include quinoa flour, brown rice flour, arrowroot flour, chickpea flour, coconut flour, and almond flour. Needless to say, there are a lot of gluten-free options for people that can’t tolerate gluten. There are many options for the third of American adults that actively try to avoid gluten consumption. In fact, the gluten-free industry is projected to climb to $23.1 billion in 2020. Even after consumption of a gluten-free diet and the removal of gluten foods, I still experience digestive issues. I don’t even consume many of the popular gluten-free cookies and breads that keep the gluten-free industry going strong. Basically, the removal of gluten from the diet may not be enough for those with non-celiac gluten-sensitivity like myself, and also others with celiac disease. Let’s take a look at the four reasons why that maybe the case. Alpha-gliadin is the main antibody measured to test for celiac disease and gluten sensitivity. However, research published in the Science Translational Medicine journal in 2010 found that there are roughly 400 types of gluten proteins found in grains, including omega-gliadin and C-hordein. The study found that these gluten proteins were even more problematic than alpha-gliadin. The key take home message here is that all grains, even the gluten-free kind, contain gluten proteins like omega-gliadin and C-hordein. While gluten-free products and foods are void from alpha-gliadin, they instead contain other gluten proteins. They also contain prolamins that are other proteins found in the seeds of certain grains like secalin (rye), zein (corn), avenin (oats), and kafirin (sorghum). The traditional gluten-free diet is really an alpha gliadin-free diet that still contains gluten proteins. This is a major reason why gluten-free diets fail. It also explains why people experience temporarily improvement on a gluten-free diet before eating gluten again. Inevitably, this approach doesn’t help, and the person continues to experience digestive issues and other health problems. There are certain non-grain and naturally non-gluten foods that have been found to cross-react with gluten, including yeast, hemp, potato, soy, chocolate, sesame, tapioca (yucca or cassava), eggs, and instant coffee. Milk and various components in milk also cause this problem like beta-casein, alpha-casein, butyrophilin, casomorphin, and whey protein. As a result, these foods trick your body into believing it’s still consuming gluten and gluten proteins. Therefore, a gluten-free diet should also exclude these food items as well. As mentioned, all gluten-free grains contain non-gliadin gluten proteins that will still trigger a reaction. These other gluten proteins will directly impact the intestinal lining through an increase of zonulin production. Zonulin is a protein that causes leaky gut syndrome. Clinically, leaky gut syndrome is called increased intestinal permeability. According to Dr. Fasano, zonulin increases leaky gut by loosening the tight junction between the cells that line your small intestine. This process is a factor in the development of autoimmune diseases, inflammation, and cancer. There are other factors in wheat that may lead to adverse health effects that many without celiac disease may experience after eating gluten-containing foods. Foods with FODMAPs (fermentable oligosaccharides, disaccharides, monosaccharides, and polyols) have also been associated with digestive issues like IBS. Some researchers have suggested that FODMAPs are the problem thought to be gluten intolerance. Oligosaccharides, called fructans, are a common FODMAP that contain fructose chains and the glucose molecule. High-fructan foods include processed wheat foods like pasta, bread, or cookies, as well as onions and artichokes. Fructans with more than 10 fructose molecules in a chain are called inulins, and those fewer than 10 are called fructooligosaccharides (FOS). FOS are commonly added to foods and supplements, and are a source of prebiotic fiber to promote good bacteria growth. Galactans are very similar to fructans, however, they contain fructose chains with a galactose molecule. Galactan-rich foods include cabbage, Brussels sprouts, and legumes like lentils, chickpeas, and soy. Disaccharides that are an issue with IBS are lactose found in dairy products, but it can also be found in beer, chocolate, and other processed products. Fructose is a monosaccharide or fruit sugar that can be an issue for some people. Fructose-rich foods include honey, apples, pears, agave, peaches, dried fruits, and papaya. It is added to commercial foods and drinks as high-fructose corn syrup. Polyols, or sugar alcohols, may be a problem if consumed in large quantities. These are found in artificial sweeteners in processed drinks and foods. These include mannitol, erythritol, glycol, lactitol, ribitol, sorbitol, arabitol, and glycerol. Wheat also contains enzyme inhibitors like trypsin and alpha-amylase, and lectins. Lectins, in particular, can be harmful in large amounts. Lectins are also found in dairy, seafood, plants in the nightshade family, and legumes like soybeans, peanuts, and beans. The trypsin and alpha-amylase also contribute to intestinal inflammation via the activation of toll-like receptor 4. Gluten is likely not the only reason you are reacting to bread and wheat. You may have a reaction to enzyme inhibitors, lectins, and some FODMAPs. You can avoid gluten, and yet, have a problem with many FODMAPs that trigger similar symptoms to gluten intolerance. Likely, you enjoy Brussels sprouts and legumes every so often that will also trigger your symptoms. What Diet Is the Solution? What diet will I eat then? Eating a healthy diet should be simple, shouldn’t it? A gluten-free diet should actually remove all grains, foods that cross-react with gluten, foods that increase zonulin levels, and foods that contain FODMAPs, enzyme inhibitors, and lectins. The next time someone suggests that gluten might be a problem with them, likely they aren’t wrong. However, the problem goes deeper than that. I recommend the Paleo diet since it is free from all grains, even non-gluten grains. At the same time, keep track of your reaction to other foods that contain FODMAPs and lectins. The basics of a Paleo diet include meat, seafood, eggs, vegetables and fruits, nuts and seeds, and fats and oils like coconut oil, avocado oil, ghee, duck fat, and butter. A Paleo diet can help heal the gut and treat digestive disorders like irritable bowel syndrome, leaky gut syndrome, celiac disease, and gluten intolerance. Biesiekierski, J.R., et al., “No Effects of Gluten in Patients with Self-Reported Non-Celiac Gluten Sensitivity After Dietary Reduction of Fermentable, Poorly Absorbed, Short-Chain Carbohydrates,” Gastroenterology, August 2013; 145(2), 320-328, doi: 10.1053/j.gastro.2013.04.051. Lanzini, A., et al., “Complete recovery of intestinal mucosa occurs very rarely in adult coeliac patients despite adherence to gluten-free diet,” Alimentary Pharmacology and Therapeutics, June 2009; 19(12), 1299-1308; doi: 10.1111/j.1365-2036.2009.03992.x. Ji, S., “The Mainstream Media Declares: Gluten Sensitivity A Myth — Who Cares?” GreenMedInfo, May 20, 2014; http://www.greenmedinfo.com/blog/mainstream-media-declares-gluten-sensitivity-myth-who-cares. “Dr. Fasano on Leaky Gut Syndrome and Gluten Sensitivity,” Gluten-Free Society; https://www.glutenfreesociety.org/dr-fasano-on-leaky-gut-syndrome-and-gluten-sensitivity/, last accessed March 2, 2017. “New Glutens Discovered to be Harmful to Health,” Gluten-Free Society; https://www.glutenfreesociety.org/new-glutens-discovered-to-be-harmful-to-health/, last accessed March 2, 2017. Tye-Din, J.A., et al., “Comprehensive, quantitative mapping of T cell epitopes in gluten in celiac disease,” Science Translational Medicine, July 21, 2010; 2(41): 41ra51, doi: 10.1126/scitranslmed.3001012. Murray, M., M.D., et al., The Encyclopedia of Natural Medicine (New York: Atria Paperback, 2012), 757-760. Sanfilippo, D., Practical Paleo: A Customized Approach to Health and a Whole Foods Lifestyle (USA: Victory Belt Publishing Inc., 2012), 27, 76, 85. Leech, J., “Dietary Lectins: Everything You Need to Know,” Authority Nutrition; https://authoritynutrition.com/dietary-lectins/, last accessed March 2, 2017. Junker, Y., “Wheat amylase trypsin inhibitors drive intestinal inflammation via activation of toll-like receptor 4,” JEM, Dec. 17, 2012; 209(13): 2395-2408, doi: 10.1084/jem.20102660. Fasano, A., “Zonulin and its regulation of intestinal barrier function: the biological door to inflammation, autoimmunity, and cancer,” Physiological Reviews, January 2011; 91(1): 151-175, doi: 10.1152/physrev.0003.2008. Fassano, A., “Zonulin, regulation of tight junctions, and autoimmune diseases,” Annals of the New York Academy of Sciences, July 2012; 1258(1): 25-33, doi: 10.1111/j.1749-6632.2012.06538.x.